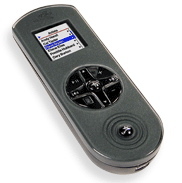 Keyspan has announced updated firmware for its TuneView for iPod, a remote with color LCD screen and 2-way RF connectivity that lets you browse and manage an iPod throughout your house or office. The update increases scrolling speed, adds an ability to jump to a specified first letter within a large list (e.g. in a collection of 8,000 songs jump directly to those starting with “L”), and improves overall wake-from-sleep performance. Released in December, Keyspan’s TuneView for iPod consists of a dock that connects an iPod to a stereo and/or TV, and an RF remote with color LCD that allows you to browse and manage iPod music and videos throughout your house. Additionally, the TuneView Dock can be used to sync an iPod with iTunes running on a PC or Mac, and TuneView supports English, German, French, and Spanish. TuneView carries a MSRP of $179.